Until recently, cathodic protection industry junction boxes had always been made the same way – electrical components had to be fastened to the backplates of the boxes, which limited their utility and configurability. Adding shunts or resistors was a painful exercise in field wiring and box disassembly, manual component installation, and reassembly, hoping throughout that the field wiring was reinstalled correctly when finished. Likewise, loose hardware connections could require that same level of effort to access the backplate and components. All of that has changed with the launch of the innovative, modular UltraBoxTM from Dairyland Electrical Industries. It provides cathodic protection personnel with easy access to all components and enables them to add, remove or reposition shunts, resistors and terminals at any time. UltraBox offers adjustable DIN rail mounting systems and snap-in modules using industry standard shunts and adjustable resistors. This gives designers and field personnel complete control over the present configuration and future expansion of their product. This highly configurable junction box is available in one of two types of corrosion-resistant enclosures: lightweight polycarbonate and 304 stainless steel. Each enclosure type and size features mounting channels that allow one or more rails to mount in horizontal or vertical orientations, providing the most flexible arrangement, considering the type and quantity of components to mount to the rails as well as the ease of cable entry and termination. Secure snap-in modules allow quick addition, removal or repositioning of electrical components on its adjustable DIN rail mounting system. A unique locking clip on each module firmly attaches it to the rail and can be quickly removed without special tools. All connections are easily accessible for superior serviceability. Pre-designed standard modules include numerous industry-standard shunts, such types SW, SS, SO, RS, and JB, and a variety of adjustable slide resistors and rheostats. Notable improvements have been made in the slide resistor design to address heat transfer issues. In addition, a unique linking header system forms an expandable shunt bus that makes connections easy, quick and safe. Extensive thermal and mechanical testing was employed to verify the performance of the UltraBox in various ratings and arrangements, providing comfort that Dairyland has engineered a new, innovative and comprehensive approach to the otherwise unchanged design of industry junction boxes. 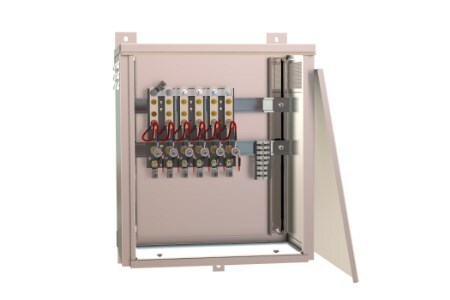 Dairyland can quickly package and ship the optimum configuration for an anode junction box, interference bond, rectifier output box, positive/negative splitter or an enhanced test station box, using standard enclosures and stocked modules containing the most common shunts, resistors and terminals.